People have been riding horses on trails for millennia, and this activity can bring great joy to the lives of people and the horses they care for. A trail that was designed and built with an eye towards environmental and social sustainability can allow riders to explore beautiful landscapes with minimal impact and without evidence of their passing. A good trail can also provide an oasis of natural serenity within the confines of a largely urban environment—picture a bridle path winding through the trees in Central Park in New York City. Conversely, a poorly built trail or one that was not designed but simply created through unplanned user activity can lead to a lackluster experience. It may simply be unpleasant due to bad choice of path within the landscape, or it can be downright dangerous due to many factors. 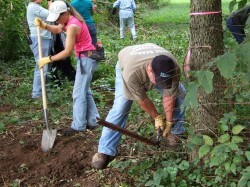 Many trail building techniques have been developed to minimize the impact of H2O on the trail. A sustainable trail does not follow the fall line (the steepest route of descent down a hill), but rather goes with the contour of the land. This keeps water off the trail and minimizes erosion. It is relatively easy to route a trail in the lowest elevation area of a particular landform. However, this is where water will naturally pool and the trail will remain wet and unusable for long periods after a rain event. Whenever possible, design and build trail on a side slope. Animals will often wear a path by traveling from food to water to shelter, but this should not be considered a “trail” for horse and human recreational use. Usually game trails run too steeply down the fall line, so a more sustainable route should be chosen. It can be human nature to want to follow the path of least resistance when building a new trail. Plotting the new trail where the brush and thorns are the thinnest does not constitute good trail building design and planning. It is important to build the trail with the contour of the land and with the use of a clinometer to determine the appropriate location for the trail based on the slope of the land. Doing the hard, time-consuming work right from the beginning of the trail project pays off with less maintenance in the future. Proper construction greatly reduces the need to continually repair and maintain trails, which allows you to spend more time riding. 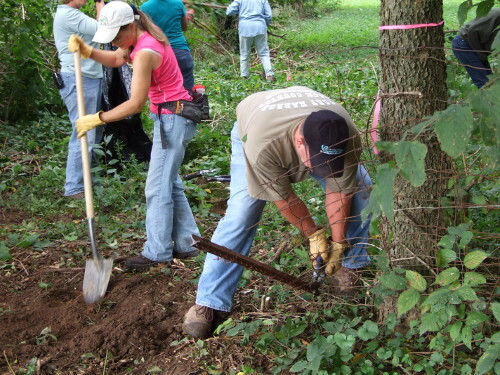 The adage, “Do it right the first time.” applies to trail building as well. Even the best built trails need periodic maintenance. Once a season, or as needed, trim back branches and vegetation that encroaches on the travelled space and remove fallen trees to encourage riders to stay on the designated trail. For the health of the trees and shrubs, it is important to trim limbs properly. Tree branches should be cut back to the next main juncture, all the way to the trunk if necessary. 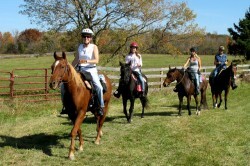 Do not allow stray branches to “poke” into the trail, as these can cause serious injury to the horse or rider. The recommended clearance height for horse trails is 10- 12 feet of vertical or overhead clearance. If puddles form on the trail, corrective action is needed. Cutting a small channel in the dirt is ineffective as doing so will simply fill in the channel with silt and eliminate the intended effect. Instead, install knicks and/or rolling grade dips. To do so, carve a wide, shallow drain (called a knick) the same size as the puddle which will keep the area drained in the future. A rolling grade dip (RGD) is a modern and more sustainable alternative to the water bar. On an older trail that is too steep, installing a RGD forces water off the trail by creating a raised mound of dirt immediately downhill of a knick. To extend the life of a sustainably built trail and to reduce the need for trail maintenance, follow this simple rule–don’t use trails when they are wet and muddy! Riding wet trails causes significant damage because it greatly magnifies the erosion process. Additionally, “post holes” that are left behind by hooves can also harden over time and lead to trip hazards for horses. Failure to follow this rule and lack of funds for maintenance is what often forces public land managers to close trails to equestrian use. 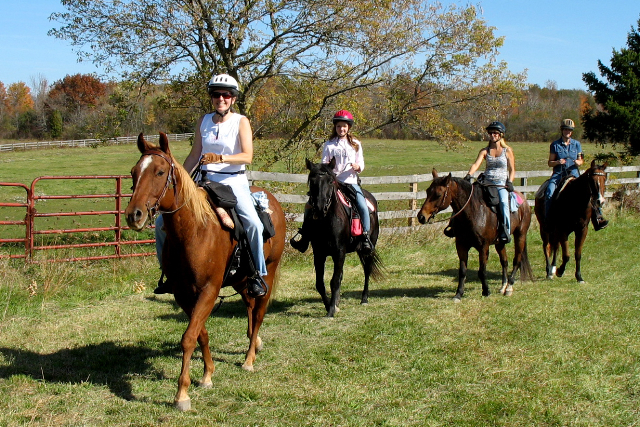 To help keep horse trails open, ride on trails designated for horses, stay off trails when wet and assist the land owner/manager by participating in sustainable trail planning, building and maintenance activities. Your participation in the sustainable trail activities will help create a win-win situation for all equestrian trail users and the landowners and agencies on whose trails we ride. We hope that this information will help you to make your trails more sustainable, safe and enjoyable for horseback riding. If you have further questions or comments, visit the author’s websites www.sstrails.com or www.elcr.org. To contact Susan, e-mail her at susan@sstrails.com or to contact Deb, email her at info@elcr.org. 1. Equestrian Design Guide Book for Trails, Trailheads and Campgrounds (USDA Forest Service Technology & Development Program) The Guidebook is free and one copy per address is available. Click here to order. 2. Geosynthetics for Trails in Wet Areas: 2008 Edition (USDA Forest Service Technology & Development Program) This publication is free and one copy per address is available. Click here to order. 3. Obtain a copy of Recreational Horse Trails in Rural and Wildland Areas – Design, Construction and Maintenance. You can purchase the book for $50 through the Department of Forestry & Natural Resources, Clemson University 261 Lehotsky Hall Clemson SC 29634 or online in the FNR stores.